The idea of a standard in education sounds good at first blush. You don’t want to have anyone fall behind. But the problem arises when a few are allowed to dictate what is “Common” and their views are allowed to indoctrinate the children of this country even if those views are contrary to the truth. Case in point, the textbooks and teaching materials that are approved by the Common Core Standards have warped interpretations of the 2nd Amendment. The Second Amendment: The people have the right to keep and bear arms in a state militia. The Second and Third Amendments – grant citizens the right to bear arms as members of a militia of citizen-soldiers and prevent the government from housing troops in private homes in peacetime. This might have been acceptable (WRONG, but acceptable) prior to Heller v DC and McDonald v Chicago but those cases were 6 and 4 years ago respectively. The issue is done, the Supreme Court has ruled (twice) that individual people have the right to keep and bear arms. These textbooks are doing nothing more than trying to brainwash students into believing a lie; with hopes that they will grow up to be like minded gun hating liberals. 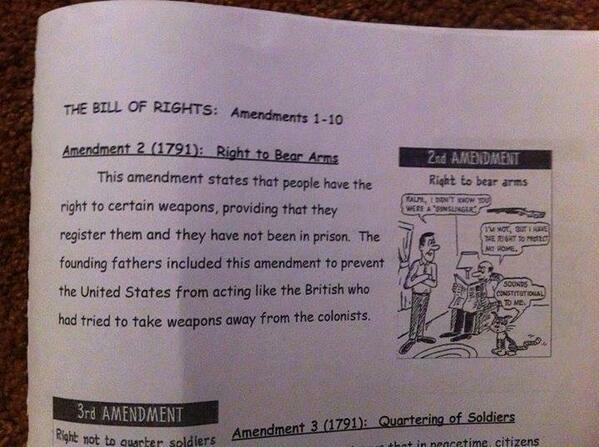 This goes beyond the textbooks as well for Common Core provides template worksheets to help teachers bring to bear, not only the destruction of the 2nd Amendment but the cheapening and undermining of all the Bill of Rights. In Bryant, Arkansas the following “assignment” was handed out to sixth graders. I know it’s a little fuzzy so I’ll highlight the important bits. 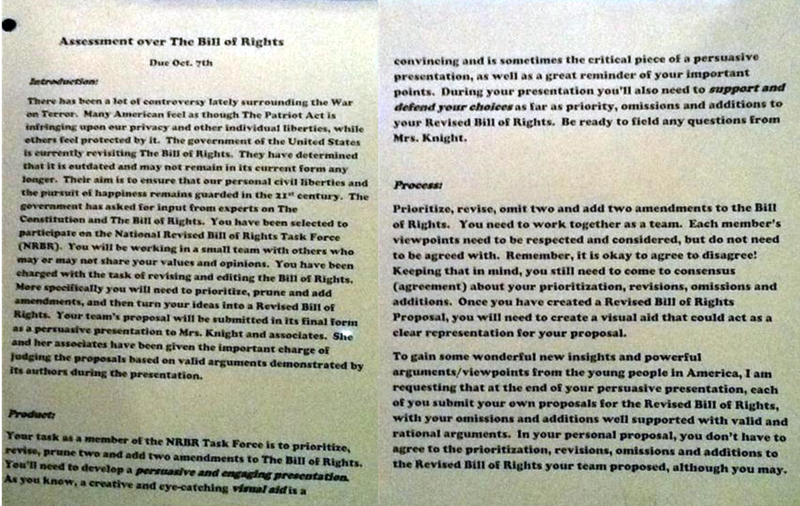 It then goes on to tell the kids, that basically, a poll is being taken to see what can be cut out of the Bill of Rights. It even leads them into thinking that they are participating in a task force called the National Revised Bill of Rights Task Force. Since when is liberty EVER outdated? Here’s the best part though, after parents complained it came to light that the students hadn’t been taught ANYTHING about how ratifying the Constitution works. They weren’t taught how government actually works but bamboozled into thinking that the Bill of Rights could be easily discarded by some “task force” for being viewed as outdated. Common Core doesn’t care about actually teaching but rather pushing their own ideology on impressionable minds. Unfortunately, the Common Core approved textbooks and worksheets aren’t the end of it, but rather only the beginning. For the teachers who are teaching this drivel use the textbooks to strengthen and justify the passing on of their own hatred for the 2nd Amendment. To clarify, the writing in blue is from the parents of the girl, the crossed out answers are the girls and were replaced by the teacher. A person gets pulled over for a traffic stop, the police DO NOT have a right to confiscate that gun and there are lawsuits aplenty in which that has been proven at the detriment of taxpayers paying settlements. And having your property seized has NOTHING to do with the 2nd Amendment but EVERYTHING to do with the 4th. This teacher is towing the gun controller zealot line (read comments for why it’s not “toeing”) and trying to dash out the spark of liberty in the young so that they may be led to believe that the government has rights to take your property without reason or cause and that it is perfectly fine for them to do so. Once again, a bastardization of the 2nd Amendment in order to promote a statist mindset that runs AGAINST what the 2nd Amendment is actually intended to protect. Firstly, they remove “the right to keep and bear arms” and instead say that the people have the right to “certain weapons.” Beyond laying the mental foundation in children to believe that gun bans are somehow constitutional it also promotes the idea that you may have your weapon so long as you don’t use/carry/bear it in any way. Then it flat out LIES that your weapon must be registered. This is the fool notion that some believe, such as President Obama, that the majority of states require you to register your firearms. That is untrue. The VAST majority require nothing of the sort and some have ACTUAL laws preventing the state from creating a registry. So too does Common Core get to reject any semblance of common sense and the truth, as its intention is to indoctrinate and control the minds of tomorrow by misleading and lying to them today. Gun hating, history distorting, brainwashing may play in places like New York City and San Francisco but that is where they should stay…and that is why Common Core has got to go.